Last Day of Imari Collage and Tuesday at Seminar! | NJNA is Blogging! Last Day of Imari Collage and Tuesday at Seminar! Today was the last day for my class, Imari Collage. 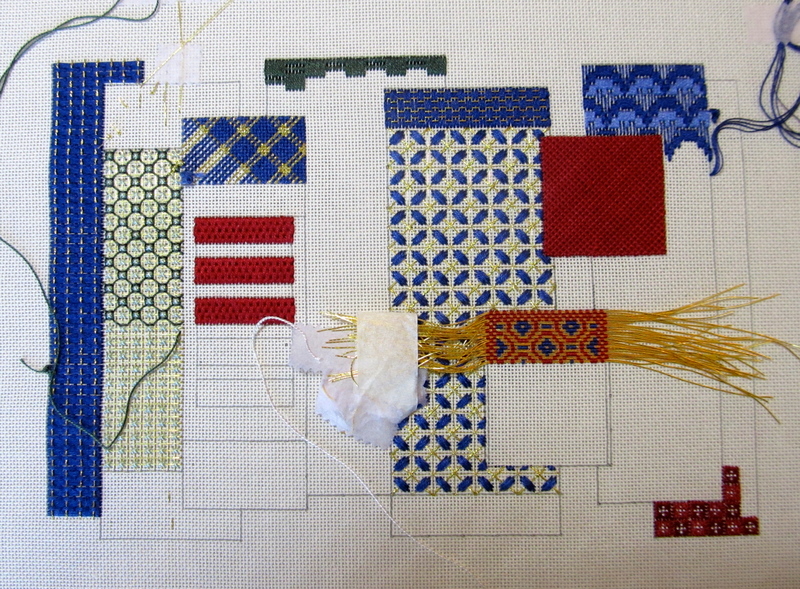 We have had such a good time stitching this and have also gotten quite a lot of stitching done. I think it would be good if classes were at least one day longer than necessary so that students could get “significant” stitching done before they leave. In my humble opinion, that would lead to more stitching finishes! You will see that I have some stitching done in “almost” every section of this design. I purposely did not stitch a few sections because I wanted to fill in enough that long, gold, layed stitches did not “snag” on things in my backpack or luggage. I can’t wait to “show and tell” this piece to you in person! In addition, I have a Japanese 5 Yen coin to attach to the red square and five bamboo beads to attach in the red rectangles. In other interesting news today: Susan Rossi won a door prize! I consulted my participant list and unfortunately this was not our NJNA Sue Rossi, but someone who lives in Malibu, California! What a coincidence! The seminar newspaper today credited Linda Mosch for her donations to the Opportunity Baskets — Linda will have to let us know what she sent in. Total value of ALL the Opportunity Baskets is in excess of $15,000. Tonight, Sue and I had dinner with Anne Carol at a Chinese restaurant across the street from the hotel. I think they cooled the dishes down for our western palates! But I convinced them to make Salt and Pepper Shrimp for me and they had sake, my beverage of choice! Tomorrow, Sue and I will be going on a sponsored tour to San Juan Capistrano followed by an authentic Mexican lunch! Hopefully, the pictures will be a little more interesting! I’m amazed how much you’ve gotten done on this. I can’t wait to see it “in person”!